Train fares increased by 1.1% in Britain last January. A recent study reveals that some Brits can still enjoy great deals for train travel and pay on average 3 times less than others. Why? Just because of where they live. Looking at specific journeys, train fares can go from £6 to £69 per 100 miles. The study was made by the travel search engine gopili.co.uk. It focuses on the cheapest train tickets available, one week in advance, from Britain’s 20 largest cities to their top destinations. Another interesting finding: Scottish train travellers pay less with Glasgow & Edinburgh placed 1st and 3rd in the ranking. The cost of travelling by train from Glasgow is on average £12/100miles. It is 3 times more expensive from Leicester where the average cost is £35/100miles. Leicester, Cardiff & Southampton rail users pay significantly more than their counterparts. 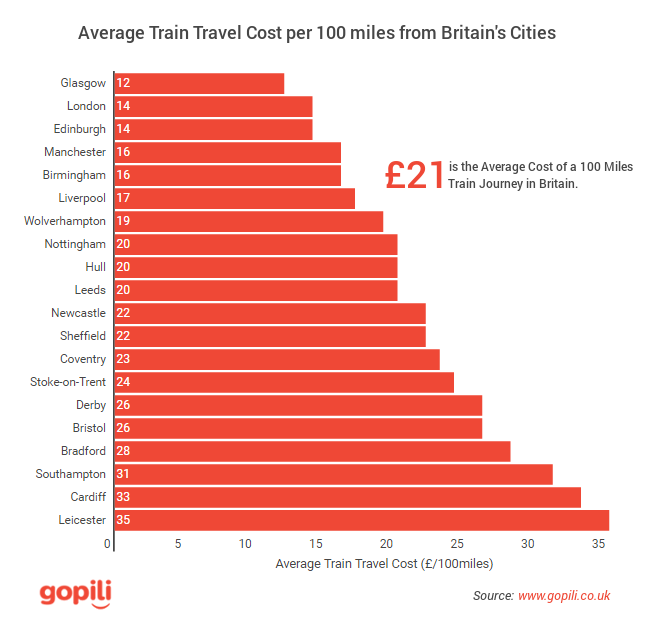 The cost of train travel reaching more than £30/100miles on average from these cities. The average cost per 100 miles to travel by train in Britain is £21. Looking at specific journeys, this cost can goes from £6/100miles (London – Birmingham) to £69/100miles (Stoke – Leeds). Compare all travel options. Ticket prices for the same journey can significantly vary whether you use the train, bus, plane or ride share. The best way to find the cheapest transportation mode is to use travel search engines which directly compare all of the options. Gopili.co.uk shows you on one single webpage journey times and prices in real-time across all modes of transport: train, coach, plane and ride share. Book in advance! You could save up to 80% on your ticket. Train tickets tend to be released 12 weeks before the departure. Flights and coaches can be available to book up to 6 months in advance. The earlier you book, the more you’ll save. Use discount cards. They can grant you a third off standard fares. They cost from £12 (coachcards) to £30 (railcards) for a year and can thus even pay for themselves after just one trip. Depending on your age and situation, you can choose between different coach or railcards. Britain’s largest cities have been identified via the 2011 Census from the Office for National Statistics. The top 10 train destinations from these cities are the ones with the highest search volume on Google. Train fares were observed on gopili.co.uk, for a research 7 days before the date of departure. Gopili aims to make the research of a transport ticket easy and relevant for travellers by providing journey times and prices in real-time on all transportation modes: train, coach, ride share and plane. Our travel search engine is available on gopili.co.uk and on mobile apps for iOS and Android users.